Animal model studies highlight the role of innate-like lymphocyte populations in the early inflammatory response and subsequent parasite control following Plasmodium infection. IFN-γ production by these lymphocytes likely plays a key role in the early control of the parasite and disease severity. Analyzing human innate-like T cell and NK cell responses following infection with Plasmodium has been challenging because the early stages of infection are clinically silent. To overcome this limitation, we examined blood samples from a controlled human malaria infection (CHMI) study in a Tanzanian cohort, in which volunteers underwent CHMI with a low or high dose of Plasmodium falciparum sporozoites. The CHMI differentially affected NK, NKT (invariant NKT), and mucosal-associated invariant T cell populations in a dose-dependent manner, resulting in an altered composition of this innate-like lymphocyte compartment. Although these innate-like responses are typically thought of as short-lived, we found that changes persisted for months after the infection was cleared, leading to significantly increased frequencies of mucosal-associated invariant T cells 6 mo postinfection. We used single-cell RNA sequencing and TCR αβ-chain usage analysis to define potential mechanisms for this expansion. These single-cell data suggest that this increase was mediated by homeostatic expansion-like mechanisms. Together, these data demonstrate that CHMI leads to previously unappreciated long-lasting alterations in the human innate-like lymphocyte compartment. We discuss the consequences of these changes for recurrent parasite infection and infection-associated pathologies and highlight the importance of considering host immunity and infection history for vaccine design. Infection with the apicomplexan parasite Plasmodium falciparum causes malaria and resulted in an estimated 214 million clinical cases of disease and 438,000 deaths globally in 2015 (1). Children are particularly vulnerable until the age of 5 y, when they become more resistant to severe forms of malaria. P. falciparum sporozoites (PfSPZs) are transmitted to the human host during feeding of infected female Anopheles mosquitoes. These sporozoites travel through blood vessels to the liver where they develop into the symptomatically silent pre-erythrocytic life cycle stage. Immunization with high numbers of attenuated PfSPZs can induce protection against malaria infection (2–7). Importantly, resistance to disease is rather short-lived due to the development of short-lived immunological memory (8). Over time, repeated exposure eventually leads to decreased disease symptoms; however, resistance against subsequent infections is limited. Pre-erythrocytic stage–specific protective immunity requires a combination of liver-resident adaptive cellular immune mechanisms, including cytotoxic CD8 T cells and CD4 T cells that secrete IFN-γ and provide help to sporozoite-neutralizing Ab-producing B cells (8, 9), but other immune processes may be of importance as well. Innate-like lymphocyte responses precede adaptive immune responses, and animal model data suggest that these early immune responses are critical for the outcome of subsequent adaptive immune responses (8). Innate-like lymphocytes have been studied in a variety of infections because of their ability to rapidly secrete IFN-γ and TNF-α and other effector molecules that control early inflammatory responses and pathogen load (10, 11). These innate and innate-like subsets include NK cells, NKT (invariant NKT [iNKT]) cells, and mucosal-associated invariant T (MAIT) cells. NK cells (CD3− CD56+) are abundant in human blood (∼13% of lymphocytes) and liver (∼31% of lymphocytes) (12). NK cell function is controlled by a balance of inhibitory (recognizing MHC class I) and activating signals, such as stress-induced ligands from the ULBP family (13). MAIT cells (CD3+ CD161hi Vα7.2+) make up 1–8% of T cells in blood and mucosal tissues and 20–45% of T cells in the liver (14, 15). The MAIT cell TCR consists of an invariant TCRα-chain (Vα7.2) and a limited range of possible β-chains (16, 17), but MAIT cells have recently been shown to have greater TCR heterogeneity than initially expected (18–20). The MAIT TCR recognizes Ag in the context of the MHC-related protein 1, which includes bacterial metabolites of the riboflavin synthesis pathway (21). We demonstrated that inflammatory and TCR signals synergize to induce MAIT cell effector function (22), although inflammatory signals can be sufficient to activate MAIT cells (23, 24). iNKT cell (CD3+ Vα24Jα18+) abundance is substantially lower in humans compared with the mouse model system. iNKT cells typically account for ∼0.02% of T cells in blood and ∼0.5% of T cells in the liver (25). The iNKT cell TCR consists of an invariant TCRα chain (Vα24Jα18) and a limited range of possible β-chains (typically V β 11), and it recognizes lipids presented by the MHC class I–like protein CD1d (26). A shared feature of these cell populations is their ability to quickly respond to inflammatory signals, such as IL-12, IL-15, and IL-18 (26, 27). A consequence of this inflammation-mediated activation is the acquisition of effector function, including expression of IFN-γ and granzyme B (grzB) (23). IFN-γ is of particular interest because it seems critical in mediating immunity against the parasite (28–35). Importantly, although inflammation appears limited during the liver stage of malaria, the proinflammatory response is pronounced during the asexual blood stage, with an increase in IL-12 and IL-18 serum concentrations (36–39). Thus, the initial inflammatory environment elicited by the infection may be sufficient to activate these cell populations, leading to secretion of effector molecules, such as IFN-γ and TNF-α. Importantly, animal model data suggest that the early inflammatory environment, and particularly IFN-γ, seems to play an important role in the ensuing parasite control, as well as disease progression, including the development of cerebral malaria (10, 40, 41). It is unknown how accurately the mouse model mimics these innate-like lymphocyte responses in human infection because, to our knowledge, the function and fate of NK and innate-like T cells following Plasmodium infection of humans have not been elucidated in detail. To address this question, we specifically examined changes in the NK cell, NKT cell, and MAIT cell populations using samples from a controlled human malaria infection (CHMI) study in a Tanzanian cohort of young adult males (age 20–35 y) exposed to aseptic PfSPZs (PfSPZ challenge) (42). We found that CHMI significantly affected the NK and MAIT cell population frequencies and that changes in the MAIT cell population persisted for ≥168 d postinfection. To further interrogate these changes in MAIT cell frequency, we used a novel method to reconstruct TCR αβ-chain usage from single-cell RNA-sequencing (RNAseq) data. Analysis of these data suggests that the MAIT cell population rebound after the blood-stage parasitemia is driven by homeostatic expansion mechanisms. Together, these data demonstrate that CHMI induces long-lasting changes in the composition of the innate-like lymphocyte compartment, with the most pronounced changes occurring in the MAIT cell population. We discuss the implications of these data in the context of recurrent infection, pathology, and vaccine development. PBMCs analyzed in this study were collected during the CHMI trial conducted in Tanzania and described in Shekalaghe et al. (42). This CHMI was conducted as a single-center, randomized, double-blind controlled trial enrolling volunteers following predefined inclusion and exclusion criteria. All volunteers gave written informed consent before screening and being enrolled in the study, and the trial was performed in accordance with Good Clinical Practices, an investigational new drug application filed with the U.S. Food and Drug Administration (14267), and an Investigational Medical Product Dossier filed with the Tanzanian Food and Drug Administration. The protocol was approved by institutional review boards (IRBs) of the Ifakara Health Institute (IHI/IRB/No25), the National Institute for Medical Research, Tanzania (NIMR/HQ/R.8a/Vol.IX/1217), and the Ethikkommission Beider Basel (Basel, Switzerland; EKBB 319/11). The protocol was also approved by the Tanzanian Food and Drug Administration (Reference Number CE.57/180/04A/50), and the trial was registered at https://clinicaltrials.gov/ (NCT01540903). Cryopreserved samples including only the participant identifier (ID; no personal or identifiable information) from this study were sent from the Ifakara Health Institute to the Fred Hutchinson Cancer Research Center for analysis with approval by the IRB (number 7349). In the 2.5 × 104 (25K) PfSPZ group, one volunteer had to be excluded from the analysis as a result of premature malaria treatment, and only volunteers who developed asexual blood-stage parasites after administration of Sanaria PfSPZ challenge were included in the analysis. Venous blood was drawn prior to the intradermal injection of PfSPZ challenge (day 0) and at subsequent time points (days 9, 28, 56, and 168) (42). Volunteers were monitored for onset of the asexual blood-stage parasitemia by examination of thick blood smears by microscopy and were treated with a curative dose of Coartem following national guidelines. A very limited number of samples were also available from blood drawn at the time of microscopy-based diagnosis of asexual blood-stage parasitemia. Importantly, although these volunteers were not malaria naive, they had not had a documented malaria episode in the past 5 y. PBMC samples were stored in liquid nitrogen and then shipped to the Vaccine and Infectious Disease Division, Fred Hutchinson Cancer Research Center for analysis by flow cytometry or RNAseq or were used for ex vivo–stimulation assays. Lymphocyte counts of volunteers participating in this CHMI were collected using a Sysmex XS-800i machine. For the phenotypic identification of lymphocyte populations, bulk PBMCs or sorted MAIT cells were stained with Aqua Live/Dead Fixable Dead Cell Stain (Invitrogen). Our gating strategy and representative FACS plots are shown in Supplemental Fig. 2, and our four FACS analysis panels are shown in Supplemental Fig. 3. PBMCs were stained with the described sort panel and sorted on a FACSAria (BD) into complete RP10. Populations sorted were CD8+ MAIT (CD3+CD8+CD161hiVα7.2+) cells. All sorts were performed on a FACSAria II. After flow sorting, single cells were captured on the Fluidigm C1 Single-Cell Auto Prep System (C1), lysed on a chip, and subjected to reverse transcription and cDNA amplification using the SMARTer Ultra Low Input RNA Kit for the Fluidigm C1 System (Clontech, Mountain View, CA). Sequencing libraries were prepared using the Nextera XT DNA Library Prep Kit (Illumina, San Diego, CA), according to C1 protocols (Fluidigm). Barcoded libraries were pooled and quantified using a Qubit Fluorometer (Thermo Scientific, Life Technologies, Grand Island, NY). Single-read sequencing of the pooled libraries was carried out on a HiScanSQ or a HiSeq2500 sequencer (Illumina) with 100-base reads, using TruSeq v3 Cluster and SBS kits (Illumina) with a target depth > 2.5 M reads. Sequences were aligned to the UCSC Human Genome Assembly version 38, and gene expression levels were quantified using RSEM and TPM values loaded into R for analyses. We used the MAST analysis platform (23) for subsequent single-cell analysis steps. Quality-control parameters for the single-cell RNAseq data included expression of ≥500 genes, alignment rate > 80%, library size >10,000, and exon rate > 30% (all four criteria have to be met to for a single cell to be included). MAIT cells were analyzed directly after sorting and were not stimulated prior to single-cell RNAseq processing. A total of 2000–20,000 CD8+ MAIT cells was left untreated or were treated with IL-12 (eBioscience), IL-15 (eBioscience), and IL-18 (MBL) at 100 ng/ml or with a combination of the cytokines and anti-CD3/CD28–coupled beads (Invitrogen). At 20 h, GolgiPlug (BD) was added at a 1:1000 final dilution. For intracellular staining, cells were fixed with Cytofix/Cytoperm and permeabilized with Perm/Wash (both from BD), per the manufacturer’s instructions, and stained for intracellular cytokines. Samples were run on an LSR II (BD) and analyzed using FlowJo software (TreeStar). Statistical significance comparing control and treated subjects was assessed using a Type II ANOVA for a linear mixed-effect model with patient-level random intercepts, with α level of 5%. R functions lmer and Anova in lme4 and car packages were used for the calculations. Comparison of time points with each other was done using a paired t test with false discovery rate (FDR) correction. To study the innate-like lymphocyte response to PfSPZ infection, we analyzed samples from a trial conducted in African volunteers pre-exposed to malaria with intradermal application of 1 × 104 (10K) or 25K purified, cryopreserved nonattenuated PfSPZs (n = 12 each group). Eleven of twelve volunteers in the 10K PfSPZ group and 10 of 11 evaluable volunteers in the 25K PfSPZ group developed asexual blood-stage parasitemia after intradermal injection of PfSPZs (42). Blood was drawn prior to the intradermal challenge (day 0) and at subsequent time points (days 9, 28, 56, and 168) (42). Volunteers were monitored for the onset of the blood parasitemia stage by blood smear and were treated with Coartem following a positive blood smear to clear the infection. A very limited number of samples were also available from blood drawn at the time of blood parasitemia diagnosis. Importantly, although these volunteers were not malaria naive, they had not had a documented malaria episode in the past 5 y. Thus, the design of this study allowed us to determine how NK, iNKT, and MAIT cell function and frequencies change early (day 9) following CHMI and to longitudinally examine the duration of these changes in a cohort that is highly relevant for malaria vaccine efforts. We initially determined whether an infection with 10K or 25K PfSPZs affects the composition of the innate-like lymphocyte compartment in the venous blood by flow cytometry. We examined the frequency of MAIT cells (CD3+Vα7.2+CD161hi), NK cells (CD3−CD56+), and iNKT cells (CD3+Vα24Jα18+) on days 0 and 9 postinfection and then after the Coartem treatment on days 28, 56, and 168. The gating strategies used and representative flow cytometry plots are shown in Supplemental Fig. 2. We observed a significant increase in the frequency of MAIT cells within the CD8+ T cell population at 168 d postinfection (p = 0.0174) in the 25K-dose challenge group. Significant changes in the frequency of MAIT cells within the CD8+ T cell population following infection with the 10K dose were not observed (Fig. 1A, left versus right panels), indicating that MAIT cells respond in an infection dose–dependent manner. This was recapitulated when calculating the absolute number of CD8+ MAIT cells in the blood (Supplemental Fig. 1). Importantly, the absolute number of CD3+ T cells (cells per microliter blood) did not change significantly over time, indicating that this population serves as a suitable reference point to display T cell subset frequencies (Supplemental Fig. 1). We next examined the frequencies of NK cells and iNKT cells (Fig. 1B, 1C). NK cell frequencies in the lymphocyte population were reduced significantly on day 28 (p = 0.0005) and on day 56 (p = 0.0083) postinfection, particularly in the high challenge group (Fig. 1B). NK cell frequencies are shown as the percentage of the CD3− lymphocyte population, but the same result is seen when analyzing NK cell numbers per microliter of blood (Supplemental Fig. 1C). In contrast to NK and MAIT cells, iNKT cell frequencies did not change significantly following the infection, regardless of the PfSPZ dose (Fig. 1C). Given the changes in the MAIT cell population following CHMI in the 25K challenge group and considering their functional potential (IFN-γ production) and abundance in the liver (up to 40% of all T cells), we primarily focused on the more abundant CD8+ MAIT cell subset for the rest of the study to determine the consequences of CHMI on the MAIT cell population. Changes in the innate-like T lymphocyte and NK cell compartment following intradermal injection of PfSPZs. 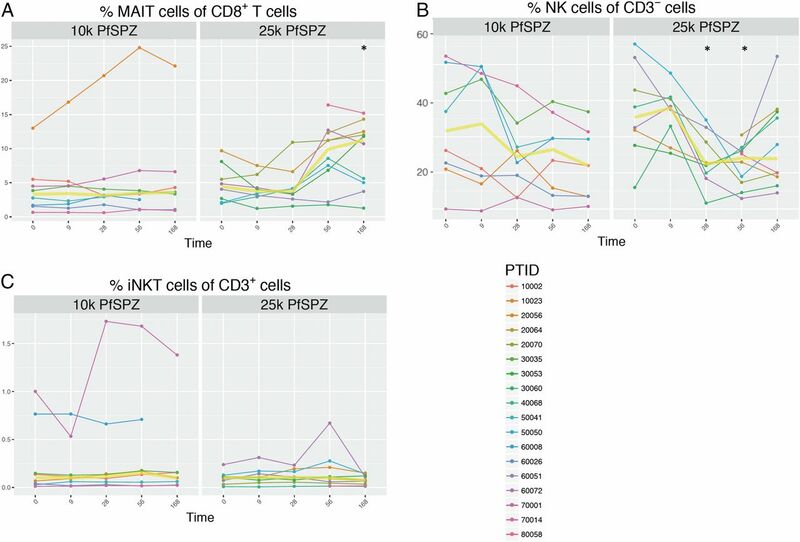 Changes in the frequency of MAIT cells within the CD8+ T cell population (A), the NK cell population (shown as frequency in CD3− lymphocyte population) (B), and the iNKT cell population (C) are shown for the low-dose challenge group (10k PfSPZ, left panels) and the high-dose challenge group (25k PfSPZ, right panels). The yellow line in each graph represents the median. Volunteer IDs are listed, with each volunteer depicted in a distinct color. Significant changes at time points following PfSPZ injection (compared with day 0) are indicated with an asterisk (*). Statistical significance comparing control and treated subjects was done using Type II ANOVA for a linear mixed-effect model. Comparison of time points with each other was done using a paired t test with FDR. We examined the frequency of MAIT cells (CD3+Vα7.2+CD161hi; CD8+ and CD8− subsets) on days 0 and 9 postinfection, during the blood parasitemia stage and then after the Coartem treatment on days 28, 56, and 168. 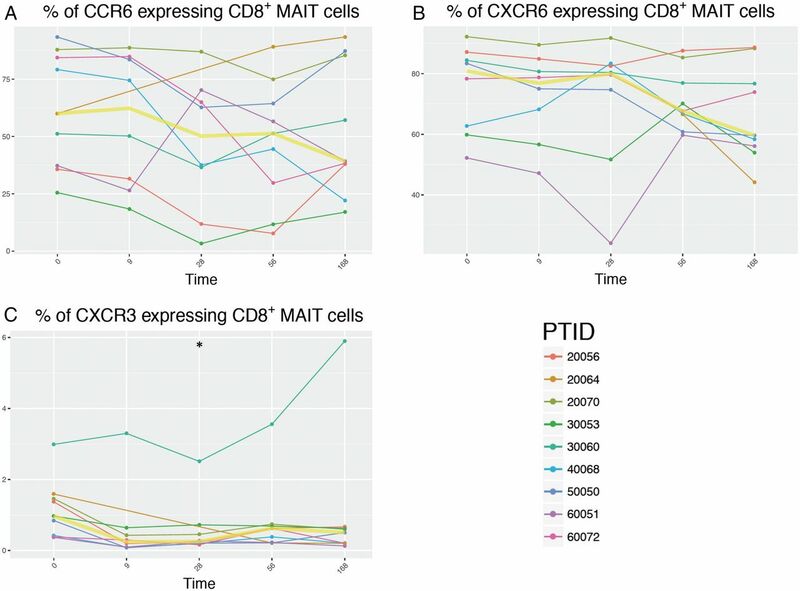 To better dissect the changes in the MAIT cell population, we looked at the frequency of all (CD8+ and CD8−) MAIT cells within the T cell (CD3+) compartment (Fig. 2A) and then subdivided the population into the CD8+ (Fig. 2B) and CD8− (Fig. 2C) subsets. We found that the frequency of MAIT cells within the CD3+ population decreased significantly during the blood parasitemia stage (p = 0.0302) and rebounded thereafter, with MAIT cell frequencies on day 168 exceeding the initial day-0 baseline level (p = 0.0072, Fig. 2A). This pattern was also observed when the MAIT population was divided into CD8− and CD8+ cell subsets (Fig. 2B, 2C). Importantly, availability of the blood-stage parasitemia samples was limited to this MAIT cell analysis experiment; thus, these samples could not be included in any subsequent experiments. MAIT cell frequency is altered following intradermal injection with PfSPZs. Shown are changes in the frequency of MAIT cells over time for each individual volunteer. Significant changes are indicated with an asterisk (*), and p values were determined using a t test. (A) Percentage of MAIT cells in the CD3+ population in the blood in the 25K PfSPZ group. Significant changes compared with day-0 baseline were observed at the blood parasitemia stage (p = 0.0302), on day 56 (p = 0.0022), and on day 168 (p = 0.0072). 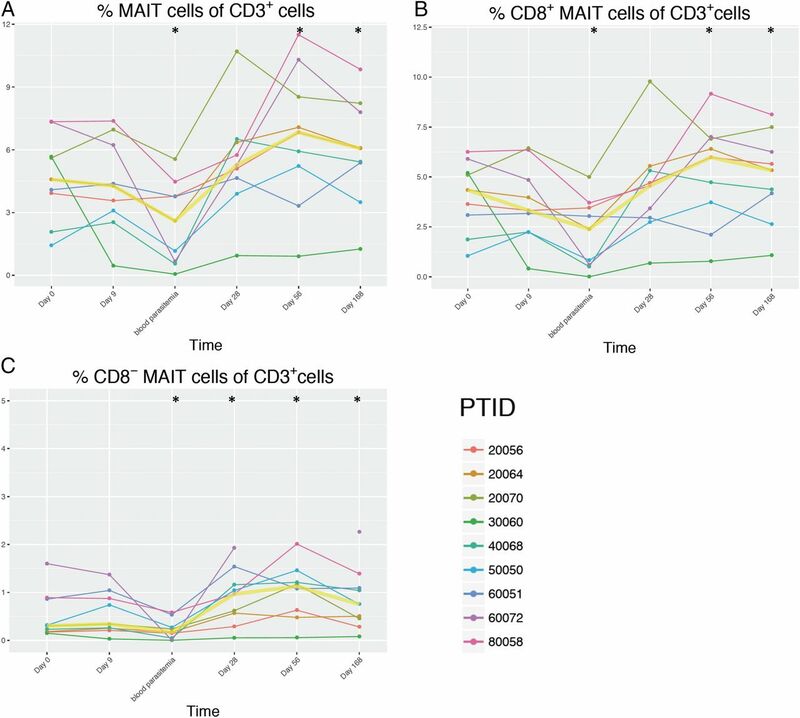 Frequency of CD8+ MAIT cells (B) and CD8− MAIT cells (C) within the CD3+ cell population. Statistical significance comparing control and treated subjects was done using a Type II ANOVA for a linear mixed-effect model. Comparison of time points with each other was done using a paired t test with FDR. Significant changes compared with day-0 baseline were observed for CD8+ MAIT cells at the blood parasitemia stage (p = 0.0278) and on day 168 (p = 0.0239). Significant changes were detected for CD8− MAIT cells on day 28 (p = 0.0003), day 56 (p = 0.0008), and day 168 (p = 0.0002). The yellow line in each graph represents the median. Volunteer IDs are listed, with each volunteer depicted in a distinct color. Exposure to proinflammatory cytokines is sufficient to induce MAIT cell activation (23, 24). Release of parasites from the liver into the bloodstream is associated with a proinflammatory immune response, which could activate MAIT cells. Thus, we first addressed whether there are signs of MAIT cell activation on day 9 postinfection. CD69 is an early marker of T cell activation and although an increase in CD69 surface expression is often used as an indicator of TCR signaling, inflammatory signals are also sufficient to induce expression (43). We examined surface expression levels of CD69 and found no significant changes on day 9 or later (Fig. 3A). Similarly, the frequency of CD25+- and CD40L+-expressing MAIT cells did not increase significantly on days 9 and 28 following challenge with PfSPZs (Fig. 3B, 3C). CD25+ MAIT cells were significantly decreased on day 56 (p = 0.0011) (Fig. 3B). Finally, NKG2D expression did not change significantly postinfection (Fig. 3D). Together, these flow cytometry data suggest that ex vivo MAIT cell activation is minimal at the interrogated time points. Limited MAIT cell activation early postinfection. Expression frequency of CD69 (A), CD25 (B), CD40L (C), and NKG2D (D) is shown for CD8+ MAIT cells in the high-dose (25K PfSPZ) group. Significant changes compared with day 0 are indicated with an asterisk (*). Statistical significance comparing control and treated subjects was done using a Type II ANOVA for a linear mixed-effect model. Comparison of time points with each other was done using a paired t test with FDR. The yellow line in each graph represents the median. Volunteer IDs are listed, with each volunteer depicted in a distinct color. To determine whether there is early (day 9) acquisition of effector function, we examined the ex vivo expression of TNF-α, IL-17, IFN-γ, and grzB by intracellular cytokine staining and flow cytometry (Fig. 4). We found no evidence of significant ex vivo MAIT cell effector function on days 9, 28, 56, and 168 postinfection. We considered two possibilities for the lack of ex vivo effector function: a lack of activating inflammatory signals and parasite-induced impairment of function. To distinguish between these two possibilities, we next tested how MAIT cells isolated before and after blood-stage parasitemia respond to TCR and cytokine stimulation ex vivo. Minimal MAIT cell effector function early postinfection. Expression of grzB (A), IFN-γ (B), IL-17A (C), and TNF-α (D) on both MAIT cell subsets was measured in the 25K PfSPZ cohort. The yellow line in each graph represents the median. Statistical significance comparing control and treated subjects was done using a Type II ANOVA for a linear mixed-effect model. Comparison of time points with each other was done using a paired t test with FDR, but no significant changes were detected. Volunteer IDs are listed, with each volunteer depicted in a distinct color. We isolated MAIT cells from five donors by FACS and examined whether their ability to respond to ex vivo stimulation was changed on days 9 and 28 postinfection compared with day 0. We measured the ability of MAIT cells to express IFN-γ, grzB, and IL-17A/F following stimulation with proinflammatory cytokines (IL-12/15/18) or a combination of TCR signals delivered by anti-CD3/CD28–coated beads and IL-12/15/18. Regardless of the time point postinfection, MAIT cells responded to both stimulation conditions and almost uniformly expressed grzB (Fig. 5A) and IFN-γ (Fig. 5B). A much smaller fraction expressed IL-17A or IL-17F at all three time points (Fig. 5C, 5D). Together, these data suggest that MAIT cells remain responsive to TCR and cytokine–mediated stimulation on day 9 or 28 postinfection. To determine whether we can identify MAIT cell activation early postinfection, we next examined MAIT cells from one donor using single-cell RNAseq. MAIT cells remain functional and responsive to stimulation ex vivo. FACS-purified CD8+CD161hiVα7.2+ cells were stimulated with cytokines (IL-12/15/18) or a combination of a TCR signal plus cytokines (TCR+IL-12/15/18), or were left unstimulated (No stim), for 24 h. Expression of grzB (A), IFN-γ (B), IL-17F (C), and IL-17A (D) was measured in five randomly chosen donors on days 0, 9, and 28. MAIT cells responded to each stimulation condition, but we did not detect significant changes when comparing MAIT cell responses to cytokine IL-12/15/18 (green bars) or TCR+IL-12/15/18 (blue bars) stimulation between the different time points (days 0, 9, and 28). We isolated MAIT cells by FACS from donor 20064 and used the C1 Fluidigm system to interrogate changes in gene-expression signatures on a single-cell level by comparing data from days 0, 9, and 28 after CHMI. Using an analysis method that we developed previously (23), we found that some, but not all, MAIT cells express grzB or IFN-γ transcripts on day 9 postinfection, but not on days 0 and 28 (Fig. 6A), suggesting that some MAIT cells are indeed partially activated on day 9 postinfection. Single-cell RNAseq analysis of MAIT cells reveals partial activation and changes in the composition of the MAIT cell population. CD8+ MAIT cells were sorted by FACS for single-cell RNAseq expression analysis by the Fluidigm C1 system. Cells sorted from donor 20064 on days 0, 9, and 28 are depicted in green, orange, and blue, respectively. (A) IFN-γ and grzB message are detected in some MAIT cells on day 9 postinfection but not on days 0 and 28. (B) Linear discriminant analysis of single MAIT cells sorted on days 0, 9, and 28 postsporozoite challenge. (C) Clonality in the MAIT cell population was examined by analyzing CDR3 usage from single cells by reconstructing their TCRα- and TCRβ-chains. Segments in the circle represent individual cells yielding a TCR sequence. Arcs connect cells sharing TCR clonotypes (TRA and/or TRB V gene, J gene, and CDR3 junction). (D) Changes in mRNA coexpression of IL-7Rα and cγ-chain (CD132) are shown in a contour plot. (E) The surface expression of CD132, measured by flow cytometry, increases on day 28, validating the single-cell RNAseq data [donor 20064 was used for (A–E)]. 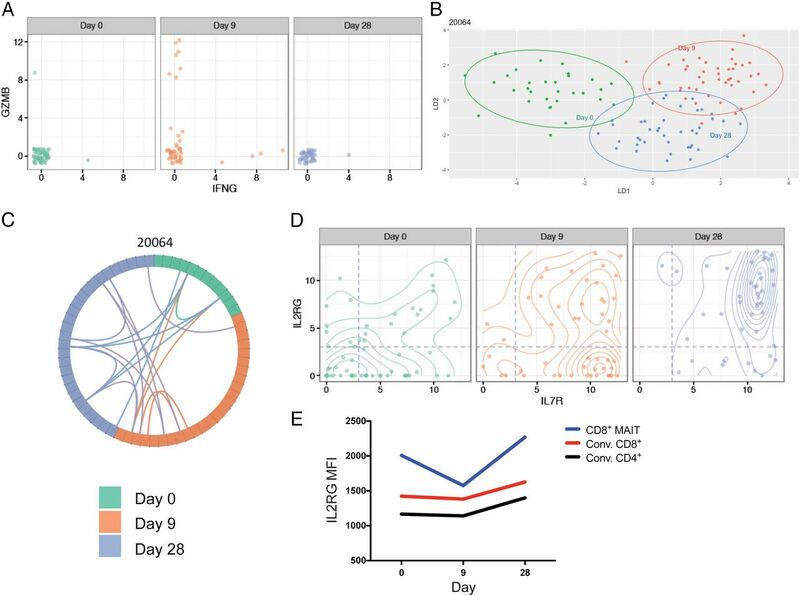 To acquire a more global understanding of the MAIT cell changes, we used the single-cell data to compare the transcriptome of these single cells at days 0, 9, and 28 postinfection. We found that the MAIT cell population displayed a distinct RNA-expression profile on each day (Fig. 6B), suggesting that they do respond to the PfSPZ challenge by day 9 and do not return to baseline transcriptional status by day 28. To better understand the nature of these changes, we next reconstructed the TCRα and TCRβ sequences from the transcriptome and analyzed the CDR3 region to identify clonal diversity (Fig. 6C, Supplemental Fig. 4). We did not observe significant changes in the relative distribution of MAIT cell clones by day 28, suggesting that the expansion of MAIT cells is not dominated by a distinct TCR-bearing clonal population. We found an increase in the coexpression of IL-7Rα and the cγ-chain (needed for signal transduction and shared with other cytokine receptors) on days 9 and 28 (Fig. 6D). Although IL-7 is typically associated with promoting homeostatic proliferation (44), recent studies suggest that IL-7 can induce MAIT cell cytotoxic function (45, 46). The increase in mRNA encoding for the cγ-chain on MAIT cells was confirmed at the protein level by flow cytometry staining (Fig. 6E). Given this potential change in responsiveness to cytokine signals, we next wanted to determine whether the expanded MAIT cell population is distinct, in terms of trafficking properties, from the preinfection MAIT cell population. To determine whether the tissue-trafficking properties of MAIT cells change postinfection, we used FACS to examine chemokine receptor expression following CHMI. To specifically determine the liver- and tissue-homing potential of MAIT cells during CHMI, we analyzed the expression of CCR6, CXCR6, and CXCR3. Briefly, CCR6 is a key receptor to enable trafficking to inflamed tissues, and CXCR6 plays an essential role for trafficking to the liver (47–49). The majority of MAIT cells expressed CCR6 and CXCR6 on their surface prior to CHMI. Overall, we found that expression of CCR6 and CXCR6 was fairly stable over time (Fig. 7A, 7B). Only a small fraction of MAIT cells expressed CXCR3, which has recently been shown to orchestrate migration of Ag-specific T cells (50). We observed an initial significant decrease (day 0 versus day 28, p = 0.0078) in the frequency of CXCR3+ CD8+ MAIT cells that was followed by an increase over time that approached the initial expression frequency (Fig. 7C). Changes in chemokine receptor expression months after the infection. The frequency of CCR6-expressing (A), CXCR6-expressing (B), and CXCR3-expressing (C) CD8+ MAIT cells was determined by FACS in the 25K PfSPZ cohort. Statistical significance comparing control and treated subjects was done using Type II ANOVA for a linear mixed-effect model. Additional comparison of time points with each other was done using a paired t test with FDR. Significant changes are indicated with an asterisk (*), and p values were determined using a t test. The yellow line in each graph represents the median. CHMI is a powerful approach to study immune responses following defined exposure to P. falciparum in different human populations (51). We report that a single intradermal infection with aseptic, purified, cryopreserved PfSPZs has profound long-lasting effects on the innate-like lymphocyte compartment in the peripheral blood of adult Tanzanian volunteers pre-exposed to malaria. To our knowledge, MAIT cells in malaria-naive volunteers undergoing similar CHMI approaches have not been studied (51). We observed a significant decrease in the frequency of blood-circulating MAIT cells following intradermal infection with 25K PfSPZs during early blood-stage parasitemia (days 11–18 postinfection). This was followed by a rebound in the frequency of MAIT cells that exceeded the initial baseline frequency and was sustained for months after the infection (Figs. 1, 2, Supplemental Fig. 1). The long-lasting (168-d) increase in MAIT cell frequency that we observed is remarkable, because an acute infection or vaccine application typically changes the innate immune system only temporarily before it returns to baseline. In contrast, long-lasting changes are seen in the adaptive immune system due to Ag-specific adaptive memory immune responses. This was elegantly demonstrated by Tsang and colleagues (52) on a systems biology level in the context of the influenza vaccine. Our data suggest that an acute infection with PfSPZ did not just result in a temporary immune perturbation but instead had a long-lasting impact on MAIT cells. Importantly, these changes occurred in an infection dose–dependent manner in volunteers infected with 25K, but not 10K, PfSPZs (Fig. 1). These two doses resulted in P. falciparum infections with different geometric mean asexual erythrocytic stage parasitemia prepatent periods of 15.4 d (10K) and 13.5 d (25K) by microscopy (p = 0.023) and 12.2 d (10K) and 11.1 d (25K) by quantitative PCR (p = 0.076) (42). This kinetic difference is presumably due to the release of higher numbers of merozoites from the liver in the 25K PfSPZ group that resulted in a shorter prepatent period in comparison with the 10K PfSPZ group. Malaria treatment decision was based on the detection of asexual blood-stage parasites in the blood by microscopy. Given the difference in detection sensitivity between quantitative PCR and microscopy, the immune system had likely been exposed to asexual blood-stage parasites for ∼2.5–3 d in both groups before initiation of Coartem treatment. Based on this similarity in the duration of the blood-stage phase of infection in the two dosage groups, the infection dose–dependent differences that we observed (Fig. 1) are likely due to an increased inflammatory response in the liver following infection with 25K PfSPZ as opposed to a prolonged infection during the blood stage. Interestingly, early after 25K PfSPZ infection, the NK cell frequency decreased significantly, similarly to MAIT cells (Fig. 1B), but then slowly (by day 168) returned to baseline levels. This decrease contrasts with data from an animal model demonstrating that NK cells in the blood expand robustly and early postinfection (40). Support for the notion that NK cells contribute to the antiparasite immune response comes from a recent study showing that human NK cells bind to and eliminate infected RBCs using cell contact–dependent mechanisms (53). Additional human studies will be required to determine which aspects of the mouse model system can be used to mimic human NK cell responses. Finally, iNKT cell frequencies were stable, regardless of the challenge dose (Fig. 1C). We argue that this is unexpected given the many similarities between iNKT and MAIT cells in terms of proinflammatory cytokine responsiveness (26). Future studies will need to address why MAIT cells, but not iNKT cells, are affected by CHMI. To examine whether MAIT cell function is altered in addition to frequency, we next examined MAIT cells for expression of markers that indicate recent activation (CD69, CD25), as well as ex vivo expression of cytokines (IL-17, TNF-α, IFN-γ, grzB). MAIT cells did not show a strong increase in expression of biomarkers that indicate activation at early or later time points (Fig. 3) or that displayed ex vivo effector function on day 9 or later postinfection (Fig. 4). Importantly, MAIT cells remained fully responsive to activating signals ex vivo (Fig. 5). These data demonstrate that MAIT cell function is not lost and argue against the existence of inhibitory signals that impair MAIT cell function following PfSPZ infection. This is in contrast to reports that suggest parasite-specific adaptive immune responses are impaired by the presence of asexual blood-stage parasites (11). Determining that MAIT cells remain functional is highly relevant, because mechanisms that activate MAIT cells in the liver could be of interest as a potential therapeutic strategy against the liver-stage disease. Because of their high abundance in the liver (up to 45% of T cells), MAIT cells may be involved in maintaining liver homeostasis during malaria parasite infections and might provide early antiparasite effector mediators (e.g., IFN-γ production) before the adaptive immune response is recruited and fully developed. The size of the MAIT cell population in the liver likely exceeds the size of the adaptive Ag-specific T cell population that could be induced by vaccination. In this context, it is also important to consider that MAIT cells have high expression levels of CCR6 and CXCR6, allowing them to traffic to the liver. Importantly, we found evidence of partial activation by single-cell RNAseq (Fig. 6A), suggesting that there are some activating, but yet unknown, stimuli early postinfection. It is noteworthy that, despite minimal initial activation, the MAIT cell transcriptome did not return to baseline in the time frame tested, because we still found transcriptional differences on day 28 postinfection (Fig. 6B). Future studies will need to examine the MAIT cell transcriptome at later time points postinfection to determine how long this functional alteration lasts. Next, we used these single-cell RNAseq MAIT cell transcriptome data to reconstruct TCRα- and β-chain usage in the MAIT cell population on days 0, 9, and 28 from the same donor. Although MAIT cells express an invariant α-chain, there are differences in the CDR3 junctions that allowed us to track distinct MAIT cell clones (Fig. 6C). Given that we observed an increase in MAIT cell frequency starting by day 28 in an infection dose–dependent manner, we asked how the TCR αβ distribution changed at these three time points. We wanted to distinguish whether the increase on day 28 is due to a relocation of the same MAIT cell population back into circulation after its sharp decline on the day of parasitemia or whether it is indicative of replenishment of the MAIT cell population via homeostatic mechanisms or de novo generation from the thymus. Our single-cell RNAseq data did not reveal significant changes in the TCR repertoire among days 0, 9, and 28, indicative of an overall MAIT cell expansion rather than a clonotype-driven response (Fig. 6C). Interestingly, a previous study reported a sustained expansion of γδ T cells following a primary CHMI in naive volunteers, but it is still unclear whether this expansion is polyclonal or clonally driven (51, 54). Importantly, in the context of the increased IL-7Rα and cγ coexpression on day 28, we argue that the increase in the MAIT cell population is triggered by homeostatic expansion. Homeostatic expansion occurs in response to available growth factors and is typically driven by cytokines (e.g., IL-7 and IL-15) whose receptor uses the common γ-chain (55, 56). Increased responsiveness to IL-7 through enhanced IL-7Rα expression could be of specific interest because it also positively affects MAIT cell effector function (45, 46). Given the temporary decrease in MAIT cell frequency in the blood of the 25K PfSPZ group, we considered that MAIT cells could migrate to other tissues or, alternatively, undergo apoptosis. A decrease in blood MAIT cell frequencies following infection is not unusual and has been reported in several other instances, including active tuberculosis (57) and HIV (58–60), although the fate of the MAIT cells in these situations has not been fully resolved. In an effort to determine whether migration may play a role in these MAIT cell changes, we examined the expression patterns of three highly relevant chemokine receptors for homing to the liver and other tissues: CCR6, CXCR6, and CXCR3 (Fig. 7). We did not find any significant differences in the expression pattern of CCR6 and CXCR6, with only a temporary decrease in CXCR3 expression early postinfection. This shows that MAIT cells remain responsive to chemotactic signals but does not provide insight into the relationship between blood and tissue MAIT cells. Ultimately, it would be necessary to examine human liver tissue to understand the dynamics of the MAIT cell response. MAIT cells are rare in mice; however, a recently developed mouse model with MAIT cell frequencies that approximate those in humans opens new possibilities for studying MAIT cells in an animal model (61). How biologically relevant are these changes in the MAIT cell and NK cell populations? NK cells play an important and nonredundant role in host defense against viruses, particularly herpesviruses. Although the frequency of NK cells eventually normalized again, it raises the question whether the PfSPZ-induced NK cell decrease may have a temporary general negative impact on host immunity, given the critical role of NK cells for protection against herpesvirus infections (62). This is particularly interesting in the context of EBV infections, because coinfection is a major risk factor for developing Burkitt lymphoma, and exposure to malaria can affect immune responses against EBV (63–65). Finally, MAIT cells have been suggested to play a role in antibacterial immunity through sensing of MHC-related protein 1–bound microbial products, but they appear quite sensitive to inflammatory cues in the absence of Ag. Thus, MAIT cells may act as an amplifier of early proinflammatory signals, and an increase in MAIT cells may lead to a more profound subsequent proinflammatory response. In the context of malaria, these changes in the early immune response to the parasite may be beneficial and contribute to clearance, and they may also exacerbate pathologies that have been associated with excessive inflammatory responses. It is important to keep in mind that we studied the immune response following a defined single malaria infection event initiated by purified, cryopreserved sporozoites of a defined genotype, NF54, and treatment occurred upon detection of the blood stage of infection. Under natural conditions, humans are exposed to multiple infectious mosquito bites carrying a range of parasite genotypes, and treatment is typically not immediate. Thus, the well-defined CHMI approach allows us to study the immune response in the context of the liver stage and the early blood stage of infection, which will help to interpret data from more complex natural infection studies. Changes in the initial immune response affect the ensuing adaptive immune response, which is of relevance in the context of vaccine efficacy. Our data demonstrate changes in the NK and MAIT cell compartment months after CHMI. Additional studies are now required to address how these changes alter the outcome of repeated malaria infections (delivered by CHMI or natural infections) that could be beneficial or detrimental for malaria-induced pathology, viral or bacterial coinfections, and vaccine take and responsiveness in individuals with recent history of malaria exposure, particularly infants and children (66). S.L.H. is associated with Sanaria Inc., who manufactured the PfSPZ challenge, and thus has potential conflicts of interest. The other authors have no financial conflicts of interest. We thank the James B. Pendleton Charitable Trust for their generous equipment donation. We thank Daryl Morris for a preliminary statistical analysis of the data and Gabriela Diaz for assistance with sample preparation. We thank Vivian Gersuk, Kimberly O’Brien, and Quynh-Anh Nguyen for excellent technical support for the single-cell RNAseq experiments. We thank all volunteers and staff of the Ifakara Health Institute, Bagamoyo Research and Training Centre, Sanaria Inc., and Swiss Tropical and Public Health Institute who contributed so much to the successful conduct of the CHMI. This work was supported by National Institutes of Health Grants DP2 DE023321 (to M.P. ), 2T32AI007509-16 (to C.K.S. ), 1U19AI089986 (to K.D.S. ), and U01 AI089859-05 (Pilot Grant to M.P.) and by the Swiss Tropical and Public Health Institute (to C.A.D.). The development, manufacturing, and quality-control release and stability studies of the Sanaria Plasmodium falciparum sporozoite challenge were supported in part by a National Institute of Allergy and Infectious Diseases Small Business Innovation Research Grant (5R44AI058375). World Health Organization. 2015. World Malaria Report 2015. WHO Press, Geneva, Switzerland.
. 2017. Protection against Plasmodium falciparum malaria by PfSPZ Vaccine. JCI Insight 2: e89154.
. 2016. Protection against malaria at 1 year and immune correlates following PfSPZ vaccination. Nat. Med. 22: 614–623.
. 2017. Attenuated PfSPZ Vaccine induces strain-transcending T cells and durable protection against heterologous controlled human malaria infection. Proc. Natl. Acad. Sci. USA 114: 2711–2716.
. 2017. Sterile protection against human malaria by chemoattenuated PfSPZ vaccine. Nature 542: 445–449.
. 2017. Safety and efficacy of PfSPZ Vaccine against Plasmodium falciparum via direct venous inoculation in healthy malaria-exposed adults in Mali: a randomised, double-blind phase 1 trial. Lancet Infect. Dis. 17: 498–509.
. 2013. Protection against malaria by intravenous immunization with a nonreplicating sporozoite vaccine. Science 341: 1359–1365.
. 2014. Malaria immunity in man and mosquito: insights into unsolved mysteries of a deadly infectious disease. Annu. Rev. Immunol. 32: 157–187.
. 2000. The complexity of protective immunity against liver-stage malaria. J. Immunol. 165: 1453–1462.
. 2007. The role of leukocytes bearing natural killer complex receptors and killer immunoglobulin-like receptors in the immunology of malaria. Curr. Opin. Immunol. 19: 416–423.
. 2004. Innate immunity to malaria. Nat. Rev. Immunol. 4: 169–180.
. 2000. Innate and adaptive lymphoid cells in the human liver. Immunol. Rev. 174: 5–20.
. 2010. Natural killer cell education and tolerance. Cell 142: 847–856.
. 2011. Human MAIT cells are xenobiotic-resistant, tissue-targeted, CD161hi IL-17-secreting T cells. Blood 117: 1250–1259.
. 2014. Toll-like receptor 8 agonist and bacteria trigger potent activation of innate immune cells in human liver. PLoS Pathog. 10: e1004210.
. 1993. Analysis of T cell antigen receptor (TCR) expression by human peripheral blood CD4-8- alpha/beta T cells demonstrates preferential use of several V beta genes and an invariant TCR alpha chain. J. Exp. Med. 178: 1–16.
. 2003. Selection of evolutionarily conserved mucosal-associated invariant T cells by MR1. Nature 422: 164–169.
. 2014. MR1-restricted MAIT cells display ligand discrimination and pathogen selectivity through distinct T cell receptor usage. J. Exp. Med. 211: 1601–1610.
. 2014. A molecular basis underpinning the T cell receptor heterogeneity of mucosal-associated invariant T cells. J. Exp. Med. 211: 1585–1600.
. 2014. Parallel T-cell cloning and deep sequencing of human MAIT cells reveal stable oligoclonal TCRβ repertoire. [Published erratum appears in 2014 Nat. Commun. 5: 4493.] Nat. Commun. 5: 3866.
. 2012. MR1 presents microbial vitamin B metabolites to MAIT cells. Nature 491: 717–723. Slichter, C. K., A. McDavid, H. W. Miller, G. Finak, B. J. Seymour, J. P. McNevin, G. Diaz, J. L. Czartoski, M. J. McElrath, R. Gottardo, et al. 2016. Distinct activation thresholds of human conventional and innate-like memory T cells. JCI Insight 1: e86292.
. 2015. MAST: a flexible statistical framework for assessing transcriptional changes and characterizing heterogeneity in single-cell RNA sequencing data. Genome Biol. 16: 278.
. 2014. CD161++ CD8+ T cells, including the MAIT cell subset, are specifically activated by IL-12+IL-18 in a TCR-independent manner. Eur. J. Immunol. 44: 195–203.
. 2003. NKT cells from normal and tumor-bearing human livers are phenotypically and functionally distinct from murine NKT cells. [Published erratum appears in 2003 J. Immunol. 171: 5631.] J. Immunol. 171: 1775–1779.
. 2015. Activation and function of iNKT and MAIT cells. Adv. Immunol. 127: 145–201.
. 2011. iNKTs foil fungi. Cell Host Microbe 10: 421–422.
. 1987. Gamma interferon, CD8+ T cells and antibodies required for immunity to malaria sporozoites. Nature 330: 664–666.
. 2010. Interferon-γ--central mediator of protective immune responses against the pre-erythrocytic and blood stage of malaria. J. Leukoc. Biol. 88: 1131–1143.
. 2002. Immunity to malaria after administration of ultra-low doses of red cells infected with Plasmodium falciparum. Lancet 360: 610–617.
. 2011. Long-term protection against malaria after experimental sporozoite inoculation: an open-label follow-up study. Lancet 377: 1770–1776.
. 2009. Protection against a malaria challenge by sporozoite inoculation. N. Engl. J. Med. 361: 468–477.
. 2002. Absolute levels and ratios of proinflammatory and anti-inflammatory cytokine production in vitro predict clinical immunity to Plasmodium falciparum malaria. J. Infect. Dis. 185: 971–979.
. 2008. Association of early interferon-gamma production with immunity to clinical malaria: a longitudinal study among Papua New Guinean children. Clin. Infect. Dis. 47: 1380–1387.
. 1999. Interferon-gamma responses are associated with resistance to reinfection with Plasmodium falciparum in young African children. J. Infect. Dis. 179: 980–988.
. 2002. Plasma levels of interleukin-18 and interleukin-12 in Plasmodium falciparum malaria. Parasite Immunol. 24: 489–492.
. 1999. The prognostic and pathophysiologic role of pro- and antiinflammatory cytokines in severe malaria. J. Infect. Dis. 180: 1288–1297.
. 2004. Serum levels of the proinflammatory cytokines interleukin-1 beta (IL-1beta), IL-6, IL-8, IL-10, tumor necrosis factor alpha, and IL-12(p70) in Malian children with severe Plasmodium falciparum malaria and matched uncomplicated malaria or healthy controls. Infect. Immun. 72: 5630–5637.
. 2006. Innate immune responses to human malaria: heterogeneous cytokine responses to blood-stage Plasmodium falciparum correlate with parasitological and clinical outcomes. J. Immunol. 177: 5736–5745.
. 2008. Experimental malaria infection triggers early expansion of natural killer cells. Infect. Immun. 76: 5873–5882.
. 2007. NK cells stimulate recruitment of CXCR3+ T cells to the brain during Plasmodium berghei-mediated cerebral malaria. J. Immunol. 178: 5779–5788.
. 2014. Controlled human malaria infection of Tanzanians by intradermal injection of aseptic, purified, cryopreserved Plasmodium falciparum sporozoites. Am. J. Trop. Med. Hyg. 91: 471–480.
. 2003. Selective depletion of nonspecific T cells during the early stage of immune responses to infection. J. Immunol. 171: 4352–4358.
. 2002. Multiple choices: regulation of memory CD8 T cell generation and homeostasis by interleukin (IL)-7 and IL-15. J. Exp. Med. 195: F49–F52.
. 2015. Arming of MAIT cell cytolytic antimicrobial activity is induced by IL-7 and defective in HIV-1 infection. PLoS Pathog. 11: e1005072.
. 2013. IL-7 licenses activation of human liver intrasinusoidal mucosal-associated invariant T cells. J. Immunol. 190: 3142–3152.
. 2008. Critical role for the chemokine receptor CXCR6 in homeostasis and activation of CD1d-restricted NKT cells. J. Immunol. 181: 81–91.
. 2016. Biliary epithelium and liver B cells exposed to bacteria activate intrahepatic MAIT cells through MR1. J. Hepatol. 64: 1118–1127.
. 2008. CCR6 regulates the migration of inflammatory and regulatory T cells. J. Immunol. 181: 8391–8401.
. 2015. CXCR3 chemokine receptor enables local CD8(+) T cell migration for the destruction of virus-infected cells. Immunity 42: 524–537.
. 2016. Immune activation and induction of memory: lessons learned from controlled human malaria infection with Plasmodium falciparum. Parasitology 143: 224–235.
. 2014. Global analyses of human immune variation reveal baseline predictors of postvaccination responses. [Published erratum appears in 2014 Cell 158: 226.] Cell 157: 499–513.
. 2014. Human natural killer cells control Plasmodium falciparum infection by eliminating infected red blood cells. Proc. Natl. Acad. Sci. USA 111: 1479–1484.
. 2011. Longevity and composition of cellular immune responses following experimental Plasmodium falciparum malaria infection in humans. PLoS Pathog. 7: e1002389. 2002. Maintaining the norm: T-cell homeostasis. Nat. Rev. Immunol. 2: 547–556.
. 2007. Rapid generation of a functional NK-cell compartment. Blood 110: 2024–2026.
. 2015. MR1-restricted mucosal associated invariant T (MAIT) cells in the immune response to Mycobacterium tuberculosis. Immunol. Rev. 264: 154–166.
. 2013. Early and nonreversible decrease of CD161++ /MAIT cells in HIV infection. Blood 121: 951–961.
. 2013. Low levels of peripheral CD161++CD8+ mucosal associated invariant T (MAIT) cells are found in HIV and HIV/TB co-infection. [Published erratum appears in 2014 PLoS One 9: e95115.] PLoS One 8: e83474.
. 2015. MAIT cells are depleted early but retain functional cytokine expression in HIV infection. Immunol. Cell Biol. 93: 177–188.
. 2015. Mucosal-associated invariant T cell-rich congenic mouse strain allows functional evaluation. J. Clin. Invest. 125: 4171–4185. 2013. Natural killer cell deficiency. J. Allergy Clin. Immunol. 132: 515–525, quiz 526.
. 2015. Does EBV alter the pathogenesis of malaria? Parasite Immunol. 37: 433–445.
. 2013. Holoendemic malaria exposure is associated with altered Epstein-Barr virus-specific CD8(+) T-cell differentiation. J. Virol. 87: 1779–1788.
. 2011. The company malaria keeps: how co-infection with Epstein-Barr virus leads to endemic Burkitt lymphoma. Curr. Opin. Infect. Dis. 24: 435–441. 2009. How might infant and paediatric immune responses influence malaria vaccine efficacy? Parasite Immunol. 31: 547–559.